Preheat oven to 350°. Spray 2 (9-inch) round cake pans with nonstick baking spray with flour. For batter: In a large bowl, stir together 1 cup water and instant coffee until dissolved. Add cake mix, eggs, and oil, and beat with a mixer at medium speed for 2 minutes. Pour batter into prepared pans. Bake for 20 to 22 minutes or until a wooden pick inserted in center comes out clean. Let cool in pans on wire racks for 10 minutes. Remove from pans, and let cool completely on wire racks. 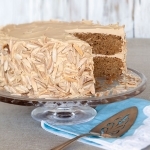 For frosting: In a small bowl, stir together liqueur and instant coffee. In a large bowl, beat butter with a mixer at medium speed until creamy. Add liqueur mixture, and beat until combined. Gradually add confectioners’ sugar, 1 cup at a time, beating until smooth after each addition. 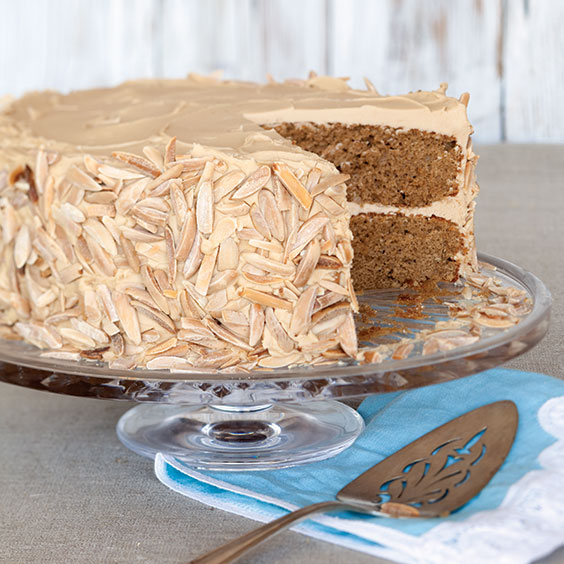 Spread frosting between layers and on top and sides of cake; gently press almonds onto sides of cake. Cover and refrigerate for up to 3 days.